We are very pleased to announce that Total Eye Care will start its first clinical study next month. The title of the study is Vascular Fundus Changes in Patients With High Probability of Chronic Cerebrospinal Venous Insufficiency. Check out the video below for more information. We are recruiting patients with either Ehlers-Danlos Syndrome or Multiple Sclerosis so please spread the word. The video has a lot of good information on the study so please do check it out. WFAA TV in Dallas produced a good video on the optomap® Retinal Exam technology. WordPress won’t allow it to be embedded here, however I’ve added it to the optomap® page on the Total Eye Care Website. An optomap® video from the TV show The Doctors can also be found there. In recognition of American Diabetes Month and World Diabetes Day on November 14, Dr. Richard Driscoll and Dr. Alycia Green urge community members to schedule yearly eye exams. Yearly eye exams are particularly important for people with diabetes or that are pre-disposed to diabetes. Approximately 25 million Americans have diabetes, representing 7% of the population, and 6.2 million Americans remain undiagnosed. Read more facts about diabetes and how the optomap® Retinal Exam is an important aid in fighting diabetic retinopathy. Here is a video where a retinal melanoma was initially diagnosed using the optomap® Retinal Exam. The optomap® is a new generation of scanning laser ophthalmoscope that takes a series of 16 photos in 1/4 of a second and puts them together making a panoramic view of the back of a patient’s eye. 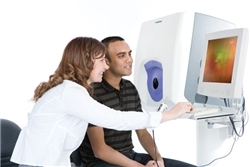 The optomap® allows us to view over 80% of the back of the eye without dilating the pupils. The optomap® was also recently featured on the TV Show The Doctors. The first 6 seconds of the video below is blank.